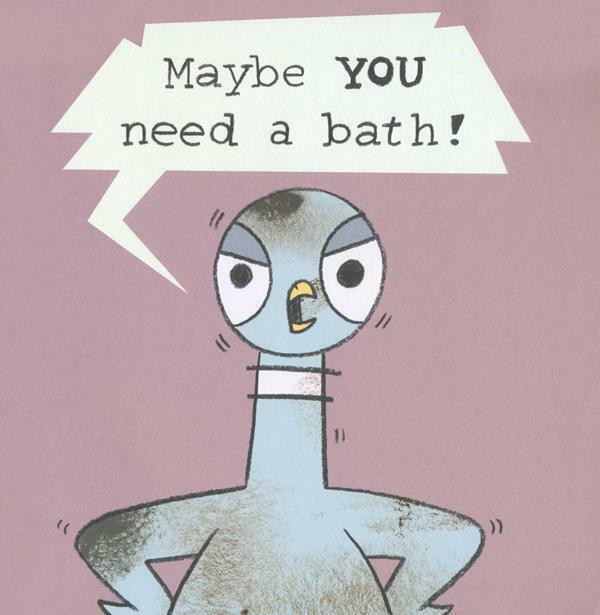 A couple of months ago I read about the idea of a “kid wash” in one of the discussions on the Storytime Underground Facebook page and knew it would be a great addition to the storytime I was planning this Spring around Mo Willems’ new book, The Pigeon Needs a Bath. 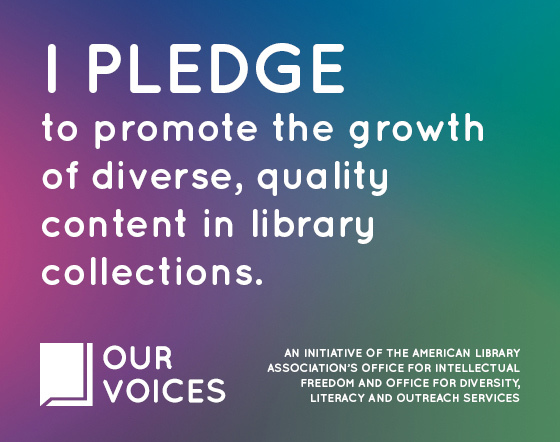 And that is how a storytime is born, my friends! A great activity and a witty book were combined with a few other elements to fill in the gaps and another week of fun and literacy building was had. I finally got a moment to collect my thoughts so here’s what we did. 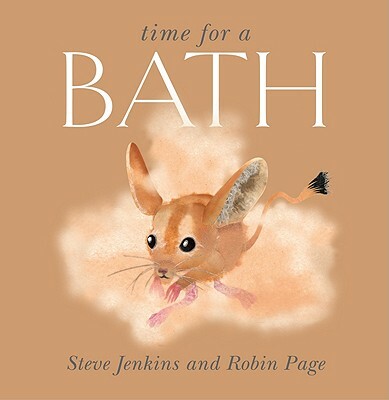 Book: Time for a Bath by Steve Jenkins and Robin Page (Houghton Mifflin Books for Children, 2011). Steve Jenkins is one of my favorite author/illustrators and his books are popular with not only preschoolers, but much older kids and adults as well. This book introduces kids to how a variety of animals bathe, some of which are quite surprising! Instead of reading the whole book to the group, ahead of time I picked out a few animals whose bathing habits would surprise the storytime crowd and stimulate discussion. Also check out their other related books: Time to Eat and Time to Sleep. Wh doesn’t love the pigeon? This book is a nice addition to Willems’ collection of pigeon stories, complete with spot on expressions that are perfect for initiating a conversation about a book’s illustrations and what they contribute to a story. I only wish I owned a copy of this story in big book format because one of the spreads includes many small images in comic-style panels which are hard for a group to see in the smaller format. How ’bout it Mo? Hyperion? Is a big book in the works? All this talk about bathing left us itching for some dancing! I brought out the scarves to use as wash cloths as we danced to Jim’s popular song. To help us get settled back down for the last story, we started this action song standing. By the final verse everyone was seated back on their mats and ready for one more read. 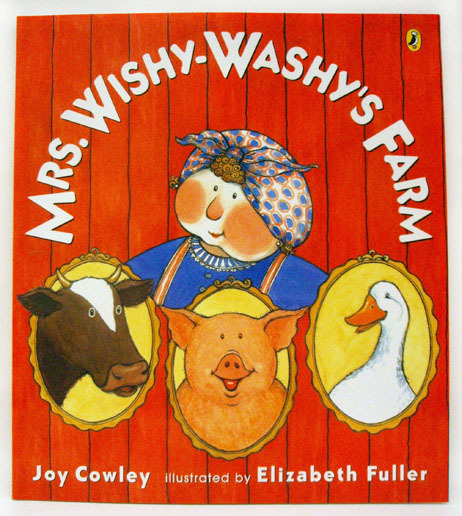 This delightful story is a fun read because of its rhyming text and high quality illustrations. It could be used in a farm storytime as well this one. The only trouble I have with this book (besides it being out of print!) is the page where it talks about the animal jail which is actually the animal shelter, although jail rhymes much better. I like to think that our shelter is less jail, and more temporary home. I talk about this page a bit when we get to it so kids understand what the author is talking about. Before the day’s activities, we sang one more song just for fun! We had two activities today. The first was the kid wash and the second was a simple art activity designed to ease the line that formed around the kid wash. Both worked well. 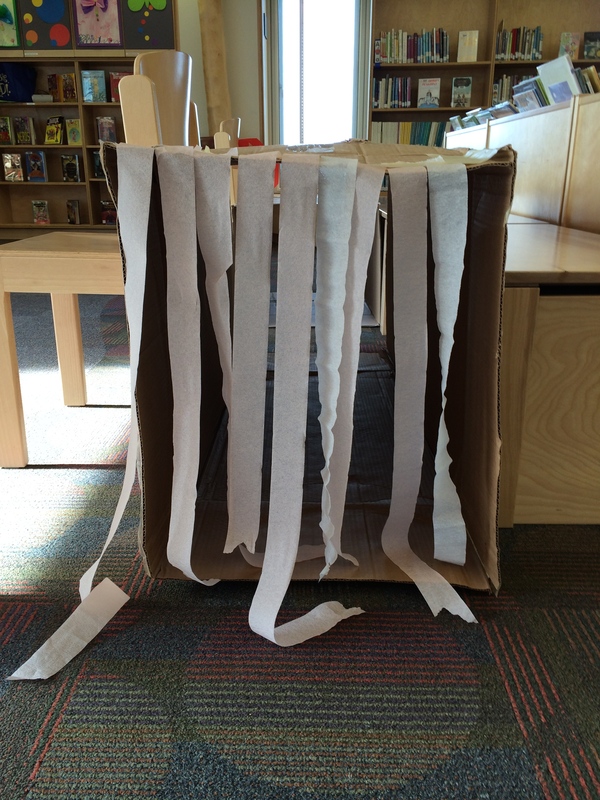 I grabbed a couple of large cardboard boxes that came through the library a few weeks ago and stored them for the kid wash. For storytime, I opened them up to form tunnels and used tape to secure the flaps. I did not connect the two tunnels because when the wash was set up, I wanted a gap in which I could blow bubbles on the kids to simulate the wash of a car wash. 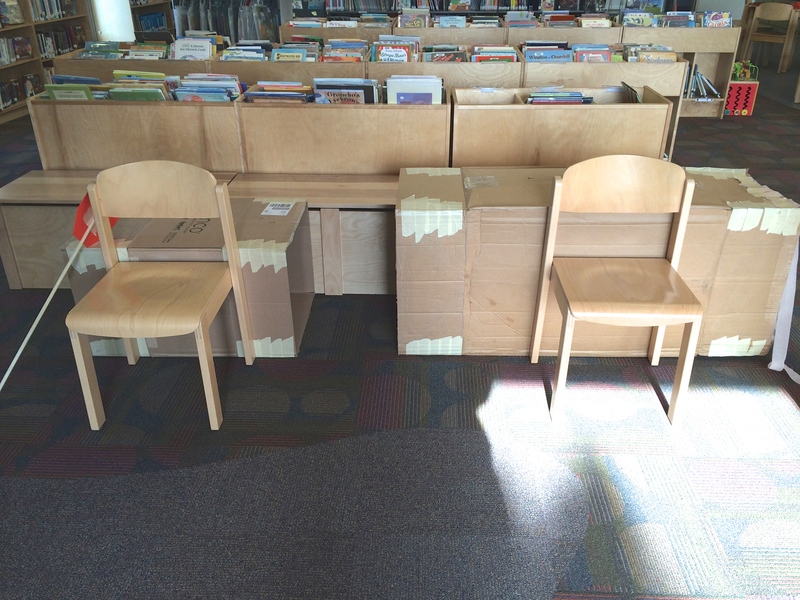 I used two chairs to keep the tunnels from falling over- the other side was pushed up against some of our picture book bins. I taped streamers over the opening of the tunnel that was going to be the exit, reminiscent of the drying that happens when you drive out of an automatic car wash. 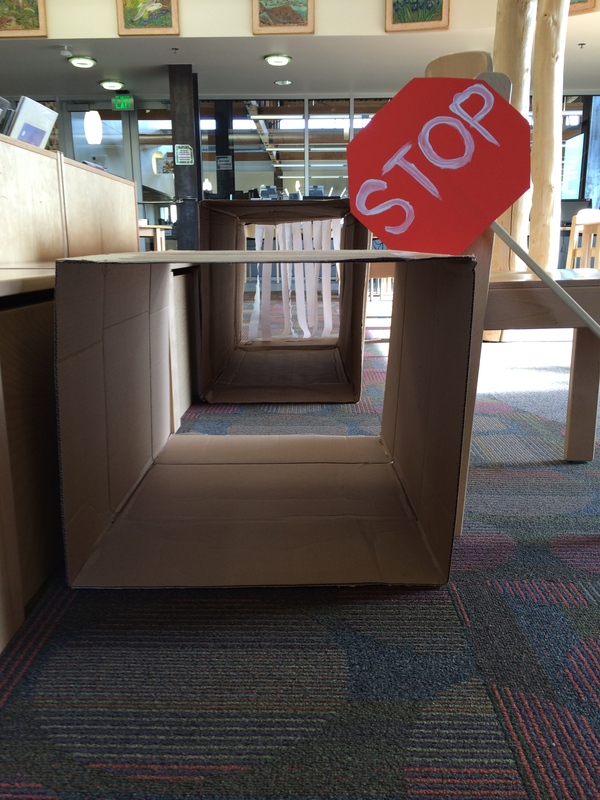 I also made a stop sign that a caregiver held at the entrance to help control kid traffic and not crowd the inside of the wash. It was a great literacy tool as well. I stood half way down the wash and blew bubbles as kids came through. Even the most hesitant kids eventually made their way through the wash and many kids made several passes. Part of the fun of this activity was that I had the parts staged, but not set up during storytime. (Storytime takes place in our children’s library and the only place to put the kid wash was in the space where we sit for storytime.) While I set up, I had the kids close their eyes for a surprise after the story portion. Most kids actually kept them closed until I said I was ready. No one expected a kid wash, so there was no secret to give away. It worked like a charm! 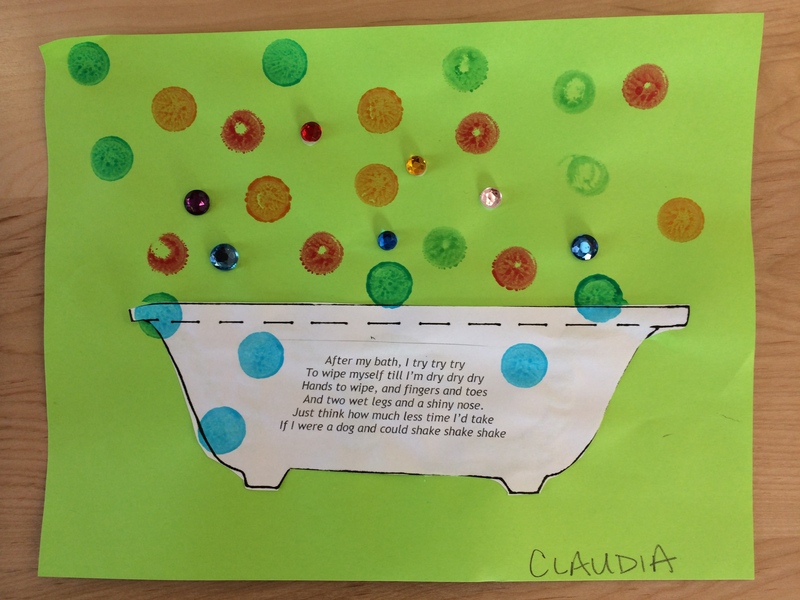 This simple craft involved a bathtub image, a poem about bathing, and stamping. I photocopied the poem into the middle of the tub image and gave each child one page. They cut out the tub and glued it on to a piece of construction paper (color of their choice). Then they used Do a Dot art markers to create colored bubbles around the bath. These markers are easy to use and satisfying for both preschoolers and toddlers, offering an alternative tool for painting. That is a REALLY fun idea! Thank you so much for the suggestion! The kid car wash is such a wonderful idea! Have fun with your drive in movie! Kids love these full-body experiences!